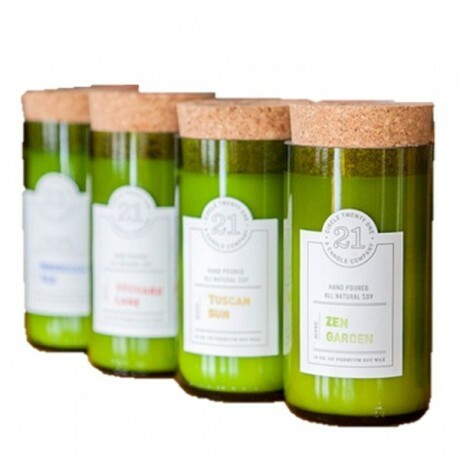 Created by Circle 21 Candles in Amarillo from premium soy wax and fragrant oils. 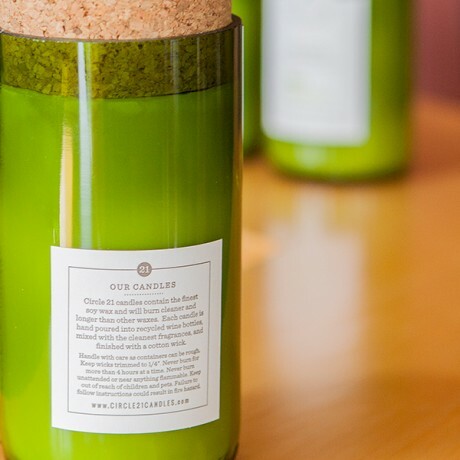 Each candle is hand poured into a recycled wine bottle. The result is a clean burning 12 ounce candle that lasts for approximately 60 hours. Candles may arrive in either green or clear bottles. Orchard Lane: Blood orange sweetened with strawberry, rasberry, and juicy mandarin. Zen Garden: A fresh, light, green tea infused scent with a hint of lemon. Moroccan Tile: Inspired by the Mediterranean, a scent with notes of cinnamon, cranberry and citrus.